Since the day I first showed up at the airport many years ago, I have heard about Piper Cubs. Since the day I first showed up at the airport many years ago I have heard about Piper Cubs. Everyone described them as a great airplane that was fun to fly. Even non-pilots recognize the Cub name and refer to them, not really knowing anything about them. If other pilots spoke so highly about them I figured what they said must be true and I joined the ranks of aviators who wanted to own one. As time went on and I became exposed to back country type flying my interest in Cubs grew, only now more along the line of higher performance Super Cubs which are known for their short field capabilities. For as long as I have been interested in them prices have been high and I couldn’t see one in my future. I only dreamed of flying low and slow and landing in remote places with minimum need for runways. I had seen the videos where cubs were landing in river beds and mountain tops with tall trees and big rocks everywhere. The dream was compelling and I was drawn to experience it. The plane was delivered by the builder to my friend’s hangar at his private strip where the purchase was finalized. Before flying it the cute little cub sat in his hangar for a few days while some minor repairs were done to it. When a neighbor who also was an experienced Cub owner came by they decided to fly it around the pattern. The preflight was completed and it was discovered that one fuel tank was empty. The fuel selector was turned to the placarded side with fuel and the pilot started the engine. On take off about 60 feet in the air the engine quit. This is a vulnerable part of the take off sequence and the plane sank to the ground with a high rate of descent collapsing the landing gear with a subsequent prop strike and cowl damage. At high angle, slow climb conditions the tail looses a lot of its authority when the engine stops producing thrust and the airplane sinks at alarming rates when airspeed is below 60 miles per hour. I think that is what happened and at a low enough altitude that recovery options were minimal. I like to climb out at a slightly increased airspeed for this reason. The aircraft had run out of gas. Unfortunately the fuel selector valve had been placarded inaccurately during construction and when the pilot selected the tank that had fuel he was actually selecting the empty one. An innocent mistake that could have had a much worse outcome. As a result of analyzing this I have decided I will not take off in an aircraft with one empty tank. The pilot was unhurt but the damage was extensive to the aircraft. My good friend was devastated and over the next weeks decided to sell the damaged aircraft as is. Sadly, the aircraft had not been insured yet and finances would not allow him to repair it within his budget. This was my chance to own a Cub. I was excited about this one because the airplane had a lot of nice options and at the time I had the resources to make it happen. I hooked up my big enclosed trailer and went to go get it. Repairs were more than anticipated and the cost to do it was much higher than expected but the airplane came back to life a couple years later. The process of rebuilding was very rewarding though and now I had the machine I had wanted for so long. This was a few years ago and now the airplane anxiously waits for its Saturday morning exercises each week. I don’t fly it a lot in the winter but every weekend through the other seasons when the weather is good and I am in town I automatically head for the hangar. It is purely recreational and I find it very refreshing to explore, doors open, low and slow. Often I travel only a few minutes away to the shoreline of the Great Salt Lake. It’s flat with no rocks or obstructions and a fun place to practice landing and take offs with all sorts of techniques. The shoreline can be deceiving though and the ground can appear dry when it is not. I have known more than one who unexpectedly sunk a nose wheel in mud that looked completely dry. The consequence can be dire, often flipping the aircraft on its back. 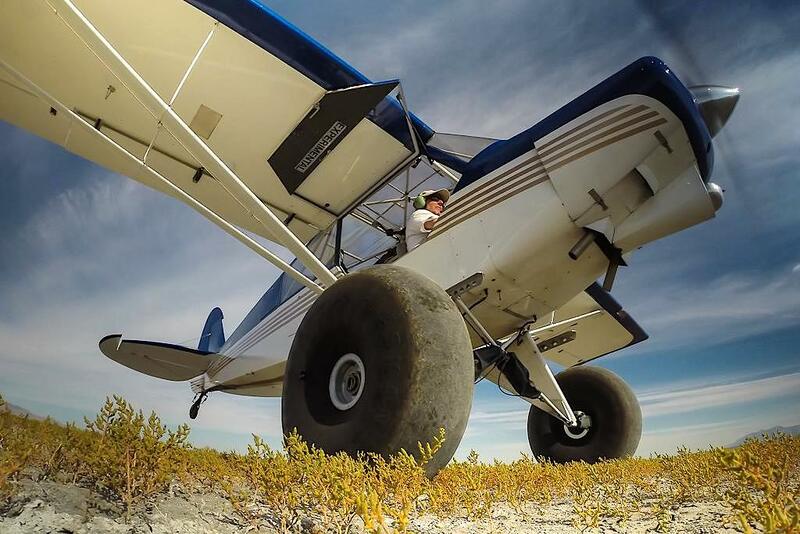 My big tires and light aircraft weight reduce the risk but I am ever cautious about the conditions. I never land without rolling a wheel for several hundred yards first. Insuring no mud gets flipped up on the wing indicating wet conditions. I have learned a lot about the plane out playing on the lakebed. Equally important I simply have fun. It reminds me of riding dirt bikes when I was young, except this is a lot better. When I come back I feel energized and refreshed. A couple weeks ago I got my son checked out and signed off for his tail wheel endorsement. 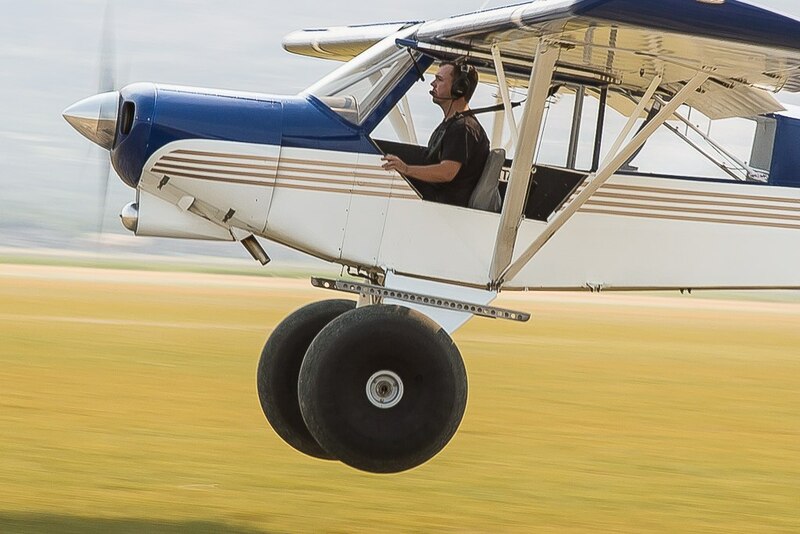 He picked up the tail wheel procedures quickly and now understands what only other tail wheel pilots do about the addiction. There is something that gets in the bloodstream that will afflict him from now on. I had borrowed a Luscombe to do his training in, but since it wasn’t my airplane I didn’t let him solo. Last week he went with me on my Saturday adventure and after a few landings I got out and took pictures while he flew around solo and did a few take offs and landings. It was fun for me to see his progress and feel his enthusiasm. Not surprising, he is in love with the cub. Now I suppose we will be competing over who gets to fly. Jim Hoddenbach has channeled his dual passion for aviation and photography into two successful businesses and a lifetime of amazing memories. As an A&P IA Mechanic with 30 years of experience, Jim has provided decades of dependable, professional, and quality work through Aero Services to his fellow aviators at the Skypark Airport. Jim also founded Canyon Air Photo with fellow pilot and friend Steve Durtschi, providing their keen eye and amazing aerial photography skills for hire. Jim's excellent photography is often on display along with his engaging articles. 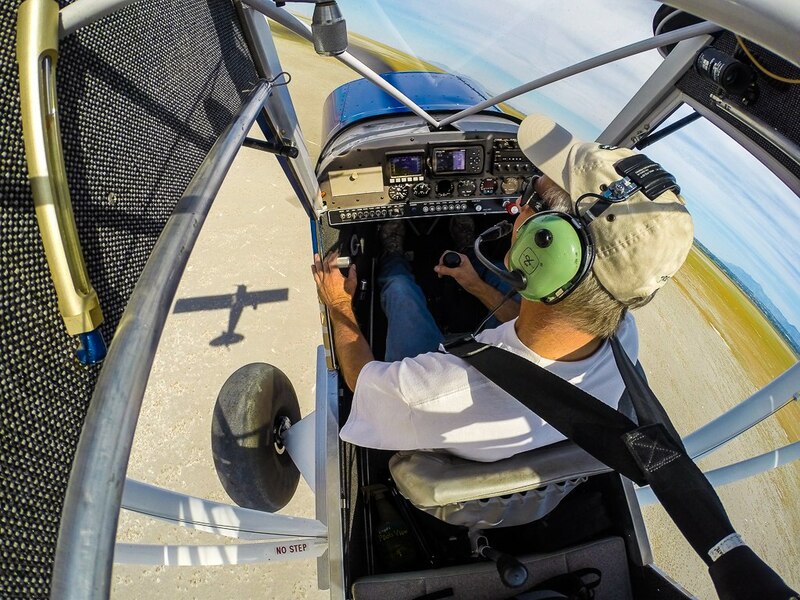 A Certified Flight Instructor, Multi Engine Instructor, fixed wing and rotorcraft pilot, and husband and father, Jim never stops working to improve his life, and the lives of those around him. Jim is a true Disciple of Flight. Great article, and those are some sweet pictures, Jim! I really like the one from high inside the cockpit. I am with Anders, Jim. You are not only an accomplished pilot but a master photographer as well. Sweet.